In December 2003 I met a woman who changed my life forever, and not just for the obvious reasons. When I started dating Erin, my now wife, and went to meet her parents, I met their pug Oscar, and quickly fell in love with the beautifully ugly breed. He had the attitude, the look and the size that was exactly what I was looking for in a dog that could live in my apartment with me. 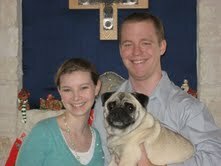 Once I decided that a pug was the right fit for me; I started looking into where the best place was to get one. I didn’t really want a puppy, as I had a full time job and didn’t have anyone to stay there and house break the dog (and didn’t want to spend the money to house train it either). I also knew that there are a lot of dogs out there that need help, so I wasn’t really wanting to go through a breeder. 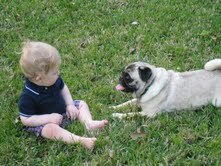 Instead, I found a rescue group called DFW Pugs and started watching their website. They’re a group based in the Dallas/Fort Worth area that rescues every pug they can find that is captured in the Texas area. The description of his personality on the website was pretty much exactly what I needed in my life, so they brought the pug they called Dr. J, over to my apartment one night to meet me. He’d been rescued outside of a town in Texas covered in mange and with a scratch on his eyeball. They’d treated and cured the mange, but he still had huge patches of hair missing. I renamed him Dozer, and we became fast friends. He came to live with me on August 4, 2004. The next day (and for the next few weeks), I took him to work with me. Fortunately I had a job where this was possible (well technically it was against the building policy, but my bosses didn’t care so it was okay) and I was able to bond with him. He was incredibly skittish and would spend 90% of the day curled up under my desk at my feet, waiting for me to move. When I had to go somewhere he’d slink along the wall about 20 feet behind me, nervously looking behind him to make sure nobody was sneaking up on him. Over the coming weeks and months he slowly grew to trust me. He’d obviously been beaten and mistreated horribly at his previous home, as he took at least a week to warm up to me and even longer to warm up to those who frequently came to my apartment. It was sad to see an animal in his state, but I was doing everything I could to try and make him feel comfortable. He would hide behind a chair in my living room, and I would have to climb over the chair to put his leash on to take him outside to use the bathroom. Eventually he started coming around, and by the time I got married and moved to Houston in 2006 he would warm up to people in a matter of hours. It was an amazing transformation. In 2007 my first nephew, Barrett, was born and Dozer took to him right away. When the nephew started crawling they were like two peas in a pod. As Barrett got older he would ask his mom and dad to come to our house to see Dozer. It was really cute to watch them together. His idiosyncrasies were also hilarious. He slept with his eyes open and he snored while awake. His bark sounded like he’d been a pack a day smoker his entire life. He was my son. On July 8, 2009 I ate breakfast in the kitchen with Dozer at my feet. Erin and I got home at the same time and I was excited at the possibility of a new job, so we decided to go for a walk with Dozer. We never got the chance, however…. We found Dozer dead and took him to my sister-in-law’s house to bury him. I was distraught and had to take the next day off work. It was like losing a member of the family after only 5 years. It was a harsh end to our time together, but there is absolutely no way I would trade our time together for anything in theworld. The bond I shared with him, the way he trusted me and the joy that he brought into everyone’s life who methim were beyond compare. I was proud to be able to help him achieve his 180 degree turnaround and prouder still that he was able to lead a normal life in spite of his beginnings. I look forward to the day we can rescue another pug; and bring the joy that was experienced with Dozer into my son, Isaac’s, life. AdoptedMomToChazzTheDog Blog would like to thank Adam for sharing this lovely story of his life with Dozer. It was heartfelt and meaningful. It points up that bringing love and happiness, for even a brief time, to a homeless, shelter/rescue dog, is a true act of kindness..and as we all know, what we as humans get back from these animals is priceless. *soft paw* Such a touching story – it’s wonderful that a chance meeting of a stranger who was to become Adam’s wife started him on the road to sharing a part of his life with such a pawsome dog. Run free, Dozer. Thanks for leaving comment and sharing the post. I hope all your friends really enjoy seeing it up here.